So, just to fill everyone in...I am not the best reader of novels. I do seem to find authors that I like and read everything they put out. Then I can't seem to decide on who to read next. I have to really connect with the author or I lose focus. I do aspire to be a better reader! I love reading blogs though (probably because you can connect with the author). I could stay on the computer for hours when it comes to blogging, but reading a book...not so good. I do like a good summer read though. 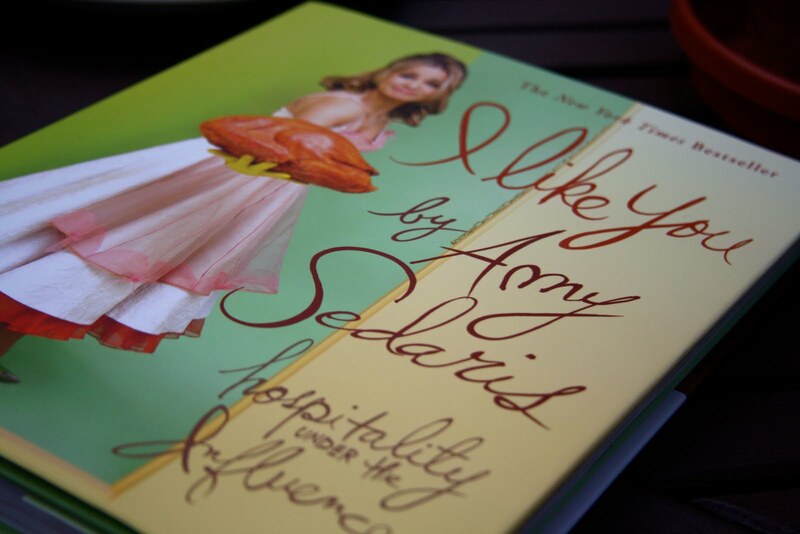 So, when I saw I Like You By Amy Sedaris Hospitality Under the Influence at the bookstore the other day, I knew I had to get it (well, with some coaxing from the illustrator because sometimes I am just too cheap). Seriously, I love her! I totally get her humor. She is snarky, witty and oh so wise when it comes to entertaining! If you like to cook and entertain people...you would like this book. The illustrator and I have been laughing our butts off just reading little bits here and there! I gave in and made pizza with the Daiya. 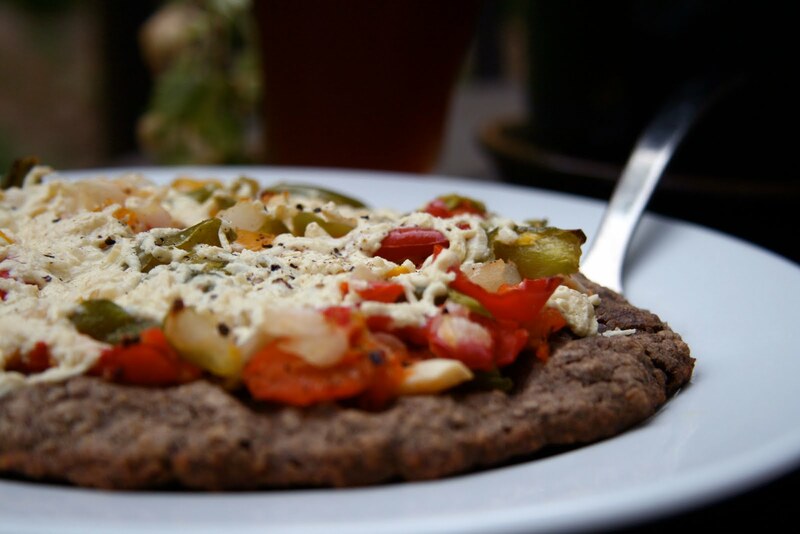 This is a buckwheat flat bread that I threw together (no yeast), with a roasted red pepper spread, Daiya, and pepper/onion mix. Ok, they win...I am sold. This stuff is really amazing on pizza! Check it out...stringy...like cheese! Sorry for those of you who can't get it...I am done with the Daiya love for now. Mostly because I am freezing the rest to save it for later use, but I am done torturing you for now. I hope everyone has a great week! For most...it is a short week, so that should start it out great! *Roasted Red Pepper Spread = Jar of leftover roasted red peppers pureed with fresh garlic, salt and pepper...YUM! So, got any suggestions for easy summer reads? I love, love, love her. I think she is hilarious! I got 3 Laurie Notaro books. She is a humorous writer that tells autobiographical stories. I have never had Daiya, but I wish I would have picked it up to put on my tuna casserole today. Ok, first off, the pizza looks fabulous. I'd love to see your dough recipe. I am a huge novel reader. I blow through books like mad. I need to check this one out - I do need a few new reads for my upcoming beach vacay! it is sh*t on a shingle day. Oh really. I am having that day today. oy everything that could go wrong or take extra time, has. sigh. your comment to me bout being less than happy and perky and it gets worse with age. i hear ya! there are days where i just wanna say you know what, i dont know. leave me alone and figure it out yourself b/c i dont have time or desire to help. LOL sounds mean and i really am not like that but we all have our days! everyone is always talking about Daiya, I have to try it! Yummy pizza!! And I love reading in the summer. I'm currently reading "Under the Banner of Heaven" which is great but not very 'summery,' just interesting! I LOVE Amy Sedaris!! This hysterical!! I love that book! It's so good! If you just want to get into reading for reading- read the Twilights- they're so freaking good! Other then that The Life of Bees is great; Summer Sisters is really good; The Poisonwood Bible is an amazing book (my fav); My Sister's Keeper is amazing; and Snowflower and the Secret Fan is really great. I try to read a lot- also, She Comes Undone, I just read that- it was beautiful and sad, but also brilliant! 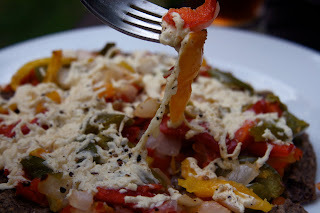 Daiya is by far the best non-dairy cheeZe I've ever had! I try to get into reading but I usually get caught up in my "busy life" and never finish a novel. I recently got THRIVE though and it's so interesting, I can't put it down!